Bayern Munich sacked coach, Carlo Ancelotti after losing 3-0 to PSG, the club announced on Thursday. 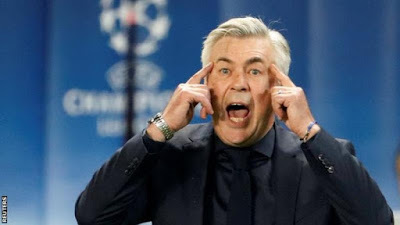 Ancelotti, 58, who helped Bayern win Bundesliga last season, but they only reached the last eight of the Champions League and the German Cup semi-finals. But Bayern have also parted company with four Italian members of Ancelotti’s backroom staff, including his son Davide. The Former player Willy Sagnol, who has been assisting Ancelotti will manage the club the meantime.